Striding confidently from the ashes of such deceased British heavyweights as Reuben and Hundred Reasons, the simmering hype behind Freeze The Atlantic is not only testament to the continuing influence and popularity of the members former outfits, but also to simply how long it has taken them to deliver ‘Speakeasy’. With the record at last in our eager mits, however, we are treated to a timely affirmation as to the oozing talent of these often unfairly overlooked musicians. With a resurgence as of late for straight-forwardly honest rock numbers (see Deaf Havana and Lower Than Atlantis), ‘Speakeasy’ does much to slot snuggly into this category, with its uncluttered melodies and chunky chord progressions. Yet, with an occasional punkish snarl breaching the elegance, there is certainly a nostalgic, 2003 flavour about proceedings. ‘Loses All The Romance’, for example, shifts from danceable alternative rock to a fiery chorus and some stomping violence to end on, whilst ‘This Fight’ and album highlight ‘Volcanoes’ place great store on their effortlessly infectiousness yet energizing aggression. Indeed, even with the undeniable impact of these full throttlers, Freeze The Atlantic‘s song writing chops translate with aplomb as glistening ballad ‘Crestfallen’ burrows under the skin. With no intrusive atmospherics or faux emotional studio polish, the track manages to tug on the heartstrings with a some simply towering vocal hooks, and a sense of raw intensity which could rival any of the more hard hitting songs here for sheer gut wrenching power. ‘Speakeasy’ impresses because it’s able to do a lot with a little. With a charming aesthetic of five guys just jamming together and a welcome lack correctional sheen, the tracks here stand alone as validation to the unwavering clout that great song smithery will continue to hold. Another exciting attention to British rocks ever widening roster. NEWS: Camden Rocks Festival confirm first wave of bands for 2015! NEWS: Camden Rocks Festival to return for 2016, featuring Young Guns, SikTh, We Are The Ocean and more! NEWS: Nightmare Festival 2014 confirm first wave of bands, including Max Raptor! 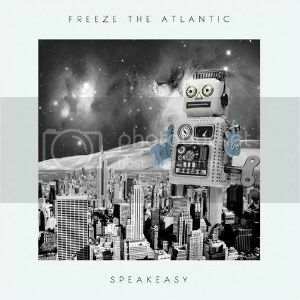 NEWS: Freeze The Atlantic split up!